This town which is located on one of the major crossroads in the Ardennes achieved captured the headlines during the battle of the bulge when the Germans didn't succeed in taking the town. 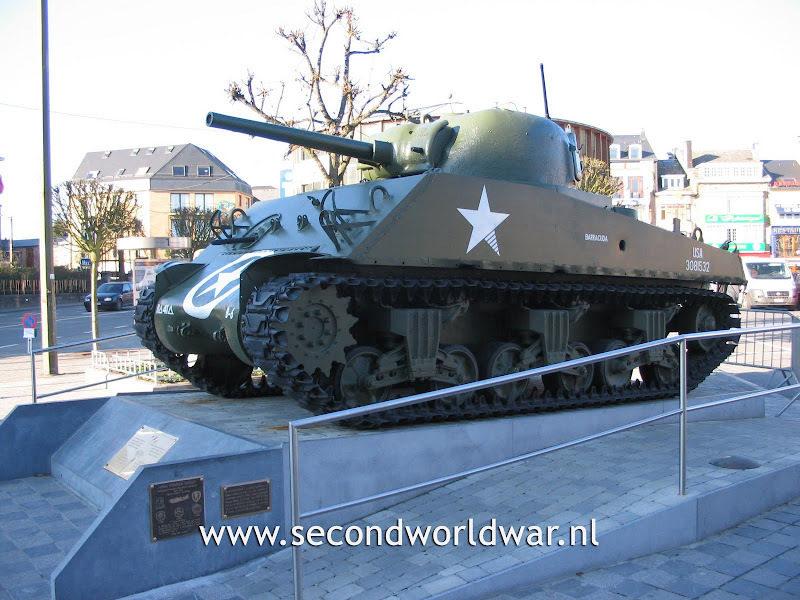 The surrounded 101st Airborne division and several armoured units defended the town for a number of days. 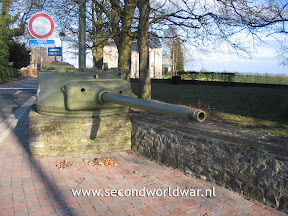 George Patton and his third army broke though to the men in Bastogne but this did not end the fighting in this sector. The Germans attacked the town for several more days before the tide had turned and the Germans where forced to retreat. Since the town was the center of the battle one can find several monuments concerning the battle in this town. One of the walls with several patches of divisions that where involved in the battle. On this monument the people of Bastogne honor their citizens that fell in both world wars. 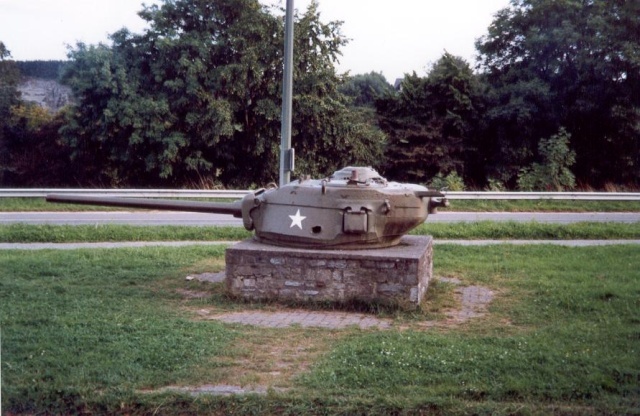 The Mardasson, is the official American monument commemorating the battle of the bulge. It stands on a hill overlooking Bastogne. On the monument you can find all the names of the American states and the patches of all the American divisions that where involved in the battle. Exposition in Bastogne in 2004 with stories from different viewpoints from those that were in Bastogne in 1945. 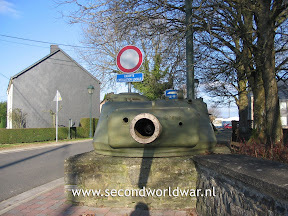 Tank turret in the center of Bastogne. Screaming Eagle monument 101st Airborne Division - Bastogne. THE INCIDENT, On the morning of 5 January 1945 13 United States soldier Demo. Platoon, HQ Company 501st Parachute Inf. Regt. 101st Airborne Division died when a truck of landmines exploded. The names of the 13 men that died in the explosion are on the monument. 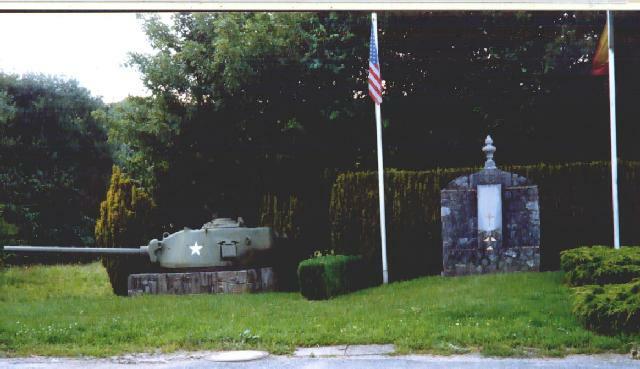 The Patton Monument at Bastogne. Patton's 3rd army broke the siege of Bastogne. 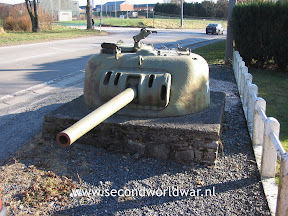 The complete monument, attached to a wall in a closed yard, near the station Bastogne Nord. Information about the Patton Monument. 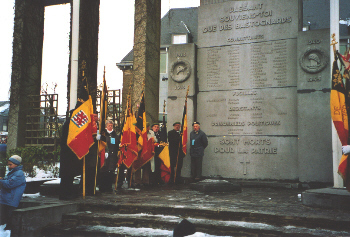 Monument honoring the 11th Belgian Fusilier Battalion at the base of the Patton Monument. It reads: "I desire to commend the 11th Belgian Fusilier Battalion for meritorious and outstanding performance of military duty while serving with the Third United States Army..., Dwight D. Eisenhower, Supreme Commander, 13 July 1945"
Voie de la Liberte 1944, the road to liberty from Normandy to Bastogne. 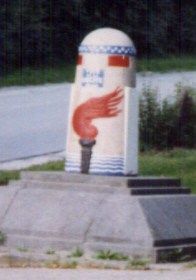 This marker stands in Bastogne, Belgium. 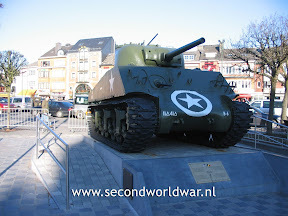 The liberation marker at Place d'McAulliffe in Bastogne. The road to freedom. The first marker stands on a square at St Mere d'Eglise and it runs all the way through France and Belgium. This is one of the last ones on the road to the Mardasson memorial. 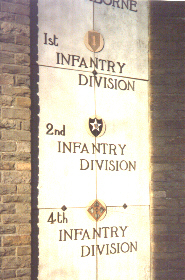 Commemorative plaque at the base of the Sherman tank in the center of Bastogne: 406th Fighter Group, England - France - Belgium - Germany 1944-1945 13612 Combat flights. 512th 513th 514th Squadrons - A tribute to all the men of this organization who did their part in bringing about a successful end to world war II. Commemorative plaques at the base of the Sherman tank in the center of Bastogne: In honor of the valiant men of the 10th US Armored division who gave their lives for freedom in the 1944-1945 ardennes campaign and in the Bastogne area. 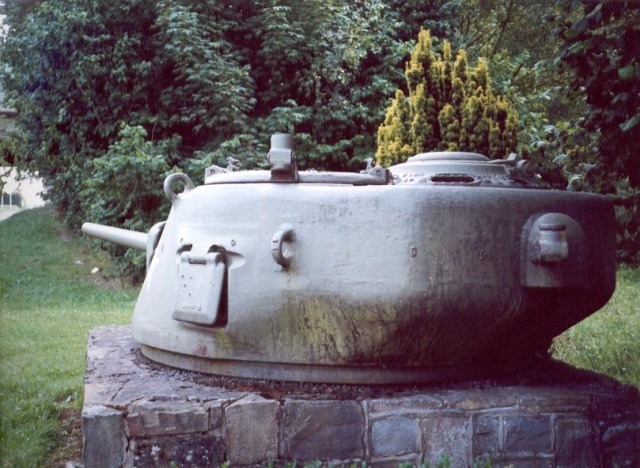 Commemorative plaques at the base of the Sherman tank in the center of Bastogne: This tank, knocked out in December 44, recalls the sacrifice of all the fighters for the liberation of Bastogne and Belgium. 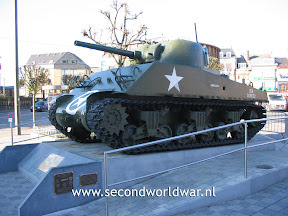 The Sherman Tank in Bastogne. 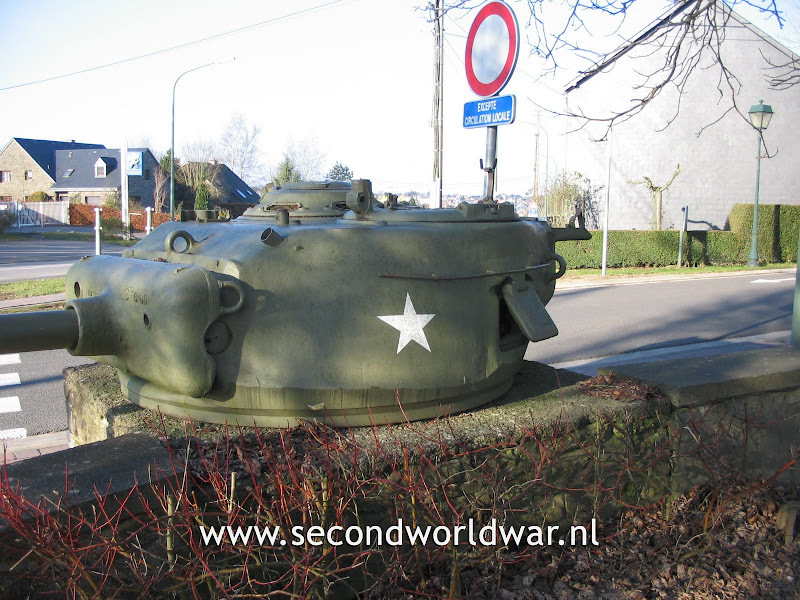 Sherman tank turret in Rue de la Chapelle, Bastogne. Sherman tank turret T23 with 76MM gun in Rue de la Chapelle, Bastogne on the road towards Arlon. Sherman tank turret M34A1 with 75MM gun garding the entrance to Bastogne, symbolizing the encirclement of Bastogne during the battle of the bulge. This turret can be found in Rue de la Roche in Bastogne, Belgium. Sherman tank turret in Rue de la Roche in Bastogne, Belgium. This is the road towards Bertogne. 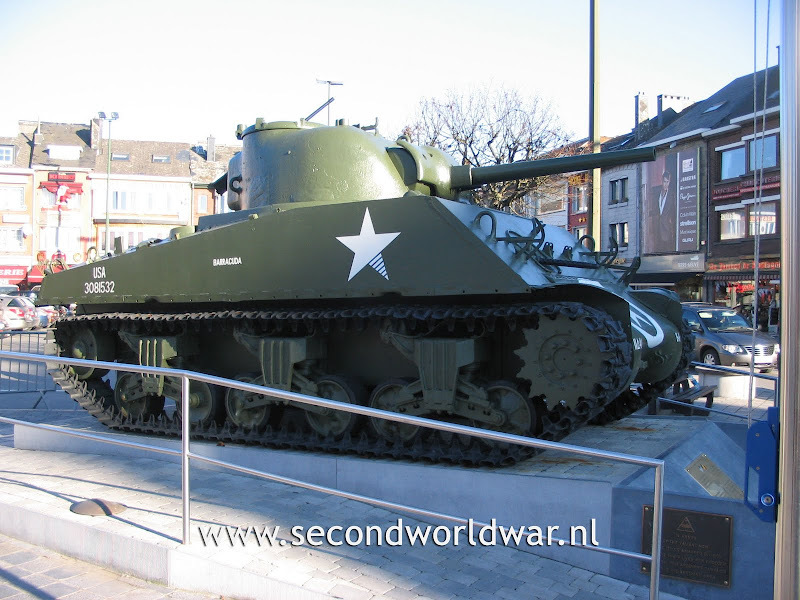 The turret of this Sherman tank is pointed towards the Mardasson, the enormous memorial which stands on a hill overlooking Bastogne. On the N874 in the direction Longvilly. Next to the tank turret you can see the monument for the first GI that gave his live liberating the town in september 1944. The GI, Lieutenant Ernest Glessener was killed on 10 september 1944 right after he had destroyed a German tank with a bazooka. 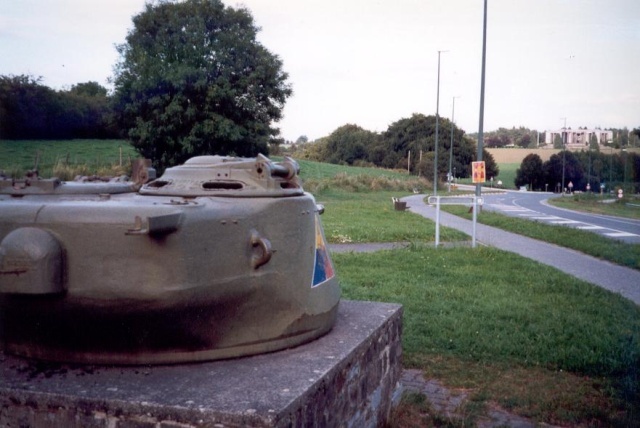 Sherman tank turret on the N874 in the direction Longvilly. A T23 turret with the patch of the 10th armored division on the side. 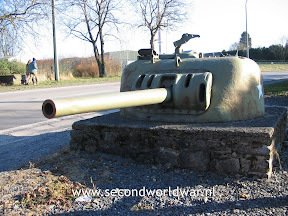 Sherman tank turret on the N874 in the direction Longvilly. The hole is from a hit by a handgrenade. 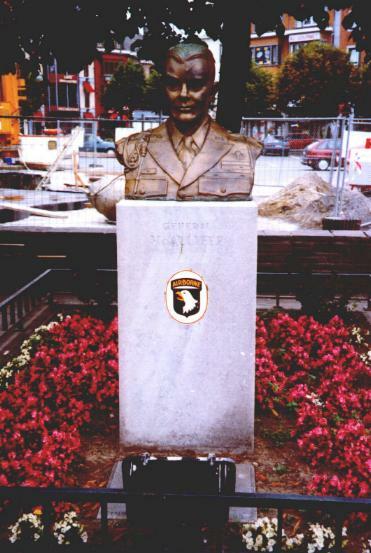 General Mc Auliffe Monument, Bastogne. Commander 101st Airborne division. General Mc Auliffe, the American commander that lead the defense of Bastogne during the battle of the bulge. Mc Auliffe was the replacement commander of the 101st Airborne division. General Maxwell Taylor, the actual commander of the division was in New York when the Germans launched their advance. 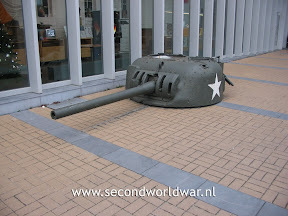 The airborne division was rushed to Bastogne from it's rest area in France, not long after the beginning of the battle.